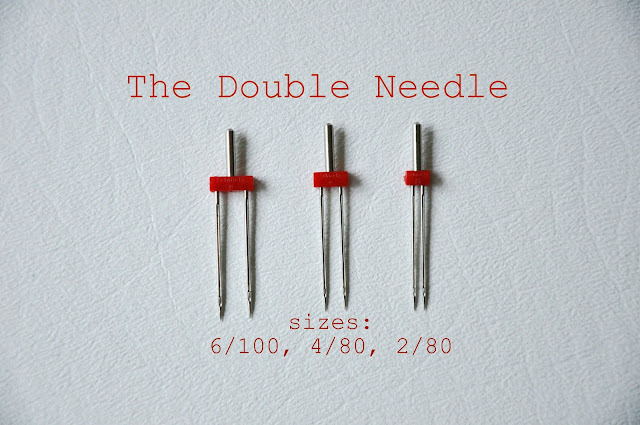 I bought a double needle about 4 years ago and have never used it! I think I'll go pull it out now! Thanks, Katy! Melanie-Hooray! You will enjoy the professional looking results. wow! something i thought was so complex, and you completely simplyfied it in 3 minutes...wow...i'm off to buy some double needles...hope i do find them here! Thank you for this! You gave me the courage to use a double needle and it works great! Now where do you find cute swimsuit materials? I got some double needles with my machine, but never had the gut to try! You make it seem so easy... maybe I can do it! Hi! 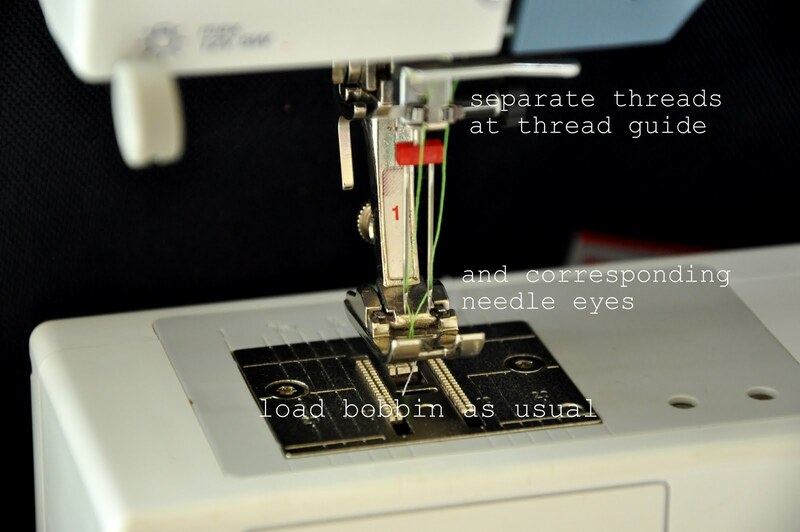 This post was very informative as I'm debating buying a serger. I like the idea of a double-needle, but I'm not sure if it'll work on my machine b/c my spool loads sideways. Is there a way to work around this problem or can you only do it with top-loading spools like the the one in the post? Mary Jo--Absolutely you can use the horizontal spool loading with this. 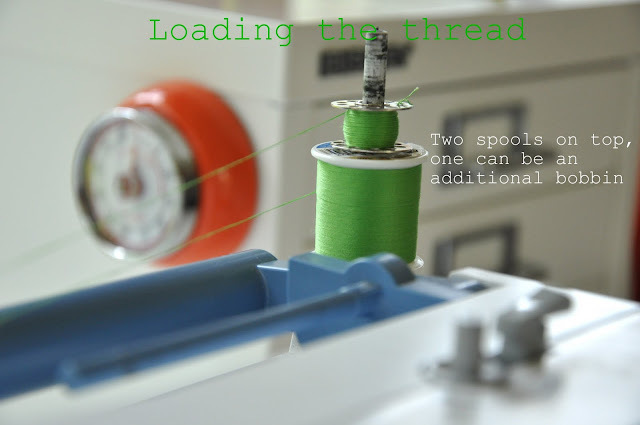 Your machine should have a little "cap" to go on the end of the spool holder to keep your thread in place. Simply put both spools on and then the cap and you're set! Just make sure they are unwinding the same way. Oh WOW This is great!!! Thank you!!! What stitch selector setting do you use with the double needles? Is that what the "stretch stitch " settings are? 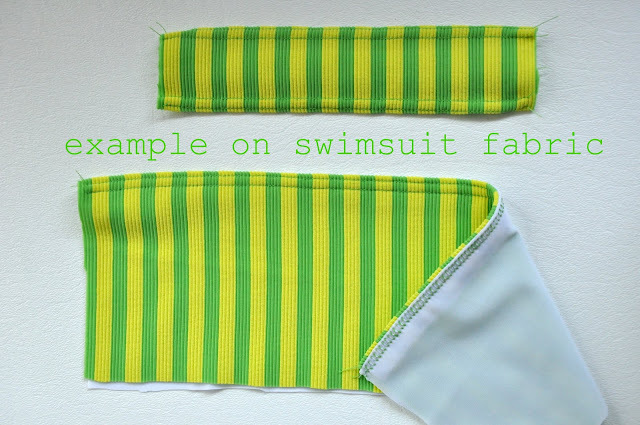 mkk-you use a regular straight stitch, but increase the length slightly (about a 3). Hi there! I'm hoping you can help me because I can't figure out my twin needle issue anywhere. 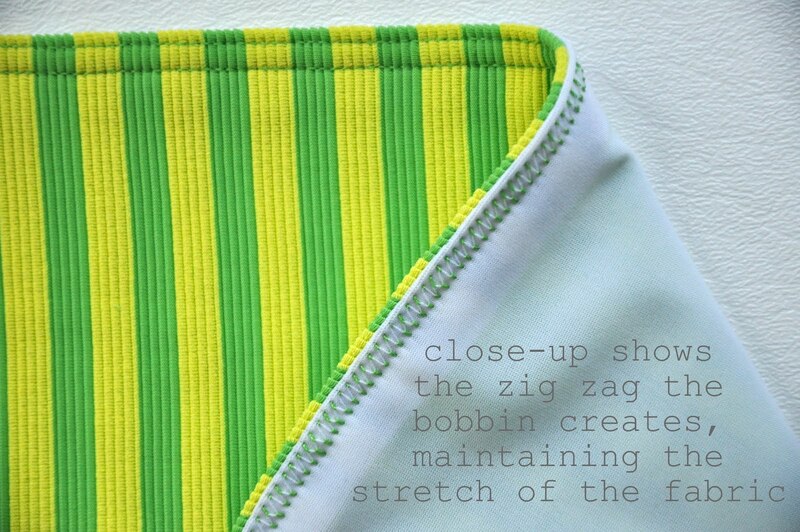 When I use my twin needle, the bobbin thread does not zigzag underneath. It just stays in a relatively straight line until I increase the needle thread tension significantly and them am left with a puffy line between my two lines of stitching on top. I hope that makes sense. Since the bobbin thread isn't zigzagging it's not having any stretch either. I have played with settings to no end and can't get it right. I get the puffy line in between my two rows of stitches too. Was there a solution to this? Keren-your bobbin thread is too tight, pulling the rows together excessively. There's a tiny screw on the bobbin case that you can adjust, but mark where it is now with a sharpie so you can readjust it. You could also try adjusting the tension on top, but it sounds like its the bobbin thread. Oh, snap! I totally did it! (I mean, after I broke the first twin needle 30 seconds in, forgetting that I had my 1/4" foot in, but still.) I am tickled pink, and I have completely forgotten all about that big bad coverstitch machine I was coveting (but could never have bought). Thank you, Katy! Do you use the regular double needle for knits or would you buy a ballpoint twin needle? Sassy T--Up to this point I've actually never used the ballpoint twin, but if you're going to be sewing mainly knits, I would definitely get that. Do you need to use elastic thread? Or what kind of thread do you recommend? do you use a regular foot for the double needle or buy one specifically for double needle?? I was at JoAnn tonight looking for double needle but no luck!! Cheryl-I don't believe Joann's sells them anymore. You'll have to order one online. I use a regular foot, as long admit accommodates the width if the needles. Depending in the feet your machine came with, you may want to switch to a foot that has a wider hole if the needle can't pass through. thank you for your reply. I will see what I can find. can't wait to try it. Thank you a whole lot. My machine doesn't have a second spool pin, so I used a straw and taped it to the back of my machine and it is lining up with the first spool. I placed the second thread and put in the needle set the settings and sewed on a piece of scrap. Voila can't believe it was so simple. Well this double needle is now my friend. Thank you.